A ne pas rater sur Arte, ce téléfilm programmé le vendredi 23 janvier 2015 (et rediffusé le dimanche 1er février au matin) qui retrace de sensible façon le combat de la boxeuse Aya Cissoko. Do not miss this telefilm on Arte, scheduled Friday, 23 January, 2015 (and rebroadcast on Sunday morning, 01 February). A touching portrait of the combat of the boxer Aya Cissoko. Any film about boxing is testimony to the tough apprenticeship of overcoming, of the taming of fury, of the mastery of one's destiny. A film about boxing is also about courage. 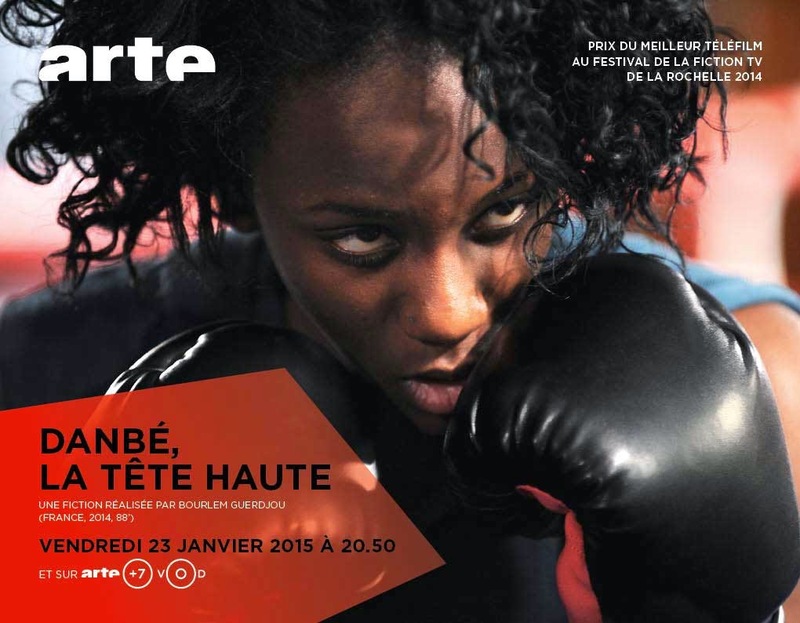 Danbé, which means "dignity" in Bambara, laudably documents the life of Aya Cissoko, a woman who holds her head high, and becomes a world champion in women's boxing; adapted from her biography co-authored with Marie Desplechin. But "Danbé, head held high" is also a story of mourning: Aya was only eight years old in November 1986 when the fire from an arson attack on a building crammed with immigrant families in Ménilmontant, engulfed her father and sister. How will the family cope? "We have to stop crying about the dead in order to let them rest in peace," but fate continues to weigh on the family: "Outside it is freezing, inside it is defeating," wrote Aya Cissoko and Marie Desplechin in their book Danbé. (1) Hence, the story of Aya is a confrontation with her mother, Massiré; a dignified woman who, in the face of injustice demands compensation during a never-ending trial. A resolute woman who resists returning to Mali; a mindful woman determined that her daughter gets an education so she is not destined to work as a cleaning woman, a battered woman constantly seeking an equilibrium, albeit fragile. "If there is a place where I hope to win, it's in the ring": Aya’s boxing workouts are an outlet for her fury and a way to prevail, to the despair of this brave mother who has difficulty understanding its relevance. "Danbe, head held high" thus is a portrait of two women; loyal to their story, it brings together with striking finesse and without pity, a biographical and personal narrative, while respecting the literary approach of the book which, focuses more on the feeling than the events. Bourlem Guerdjou returns here to the minimalist effects of realism of his first feature film Living in Paradise that was celebrated in 1998. Those who gain from this sobriety are the characters who appear in their beauty, benefiting from the camera close on the body, complementing their movements, and the editing that sustains this rhythm. Each woman has her struggle in overcoming suffering. It unfolds during the three stages of Aya’s life, as the film revolves around the delicate search for calm in their relationship. Awarded for best fiction at the last Festival at La Rochelle, "Danbé, head held high" shows that telefilms of quality are possible, that respect the language of the protagonists (Tatiana Rojo, who interpretes the mother Massiré, had to learn Bambara) and where the directing of the actors requires a long preparation after extensive casting. Assa Sylla and Annabelle Lengronne (Aya from adolescence to adulthood) had to learn to box, so that the matches are carefully executed. "Boxing is considered a violent sport. But I find that life is violent. What it inflicts without warning is far more painful than what one risks inside the ropes of a boxing ring." May one also read in Danbé, how to keep one's head up high? Social conditions, issues as much woman-related as intercultural, make this story a contemporary one. Personalities of courage, as initiatory as they are alive in their contradictions, Aya and Masiré speak to all those who face adversity and seek to triumph over it. 1. Aya Cissoko and Marie Desplechin. Danbe, Paris: Calmann- Lévy, 2011 192 p.
Jessie Chisi talks about "Between Rings: The Esther Phiri Story"